Cavechat.org • View topic - Butterfly or Alpine Butterfly? Many refer to a certain mid-rope loop as an "Alpine Butterfly Knot". Others call it a "Butterfly Knot". Is there any difference? The 1928 Wright and Magowan article introduced the name as simply "Butterfly". That article may have been the first publication of the knot too, though with knots it is probable that somebody tied it much earlier. Alan Warild's book, Vertical, has BOTH the Butterfly and Alpine Butterfly! He does not explain the difference. The small drawings in the strength table do have not enough resolution for me do tell the difference. Does anyone have an email address for Alan Warild? Please send me a private message with it. I do not want him to be the recipient of much spam. Re: Butterfly or Alpine Butterfly? Life on a Line, second edition, says: "there are a family of Butterfly knots, and it is far from clear which is the 'real' ALPINE version, as different books show different knots under the same heading." Well, that doesn't clear things up very much, but at least outlines the source of confusion. However -- EK, are you reading this? -- I was recently looking at a copy of Alpine Caving Techniques which showed a very descriptive diagram of what separates the Alpine Butterfly from the "false butterfly" or whatever one prefers to call it. I also recall reading that the non-Alpine version described here is useful as a shock-absorbing knot as it will slip under load. EK, or someone else who has a copy of ACT, can you elaborate? I'm working from my admittedly dim memory. EDIT: I composed and submitted this post before reading xcathodex's post, so that's why it doesn't explicitly recognize xcathodex's suggestion that it's the false butterfly. I'm leaving my post the same, but xcathodex beat me to it and deserves the credit. Contrary to what Dave Merchant says in Life on a Line, 2nd Edition, I don't think there's any controversy (not these days, anyway) about the identity of the knot called "alpine butterfly." I avoid the simple term "butterfly" because it is ambiguous. In cases where an author (or caver) discusses the "alpine butterfly" and "butterfly" as separate knots used for rigging applications in vertical caving, my guess is that by "butterfly" they mean what Marbach and Tourte call the false butterfly. While it is rarely tied this way, the false butterfly is perhaps best explained as a slipknot partially secured from slipping by a half-hitch tied over it on the slippy side. knudeNoggin may have a more proper functional definition. It looks a lot like an alpine butterfly, but it isn't a secure knot. It's an idea midline shock-absorbing knot, because it slips when shockloaded or loaded heavily (and slips a little in any loading). I am unfamiliar with any valid applications involving loading the loop. The easiest way to tie the false butterfly correctly (and, to the best of my knowledge, the only method that is commonly used to tie it) is to make like you're tying the alpine butterfly this way, but to twist the loop back in the opposite direction in step 2. You will have to hold it in this position until the next step, because the overall twist is now zero. Note that the false butterfly bend should never be used--it may slip all the way through...and if you wanted something to automatically disconnect in a shockload, it's not precise enough to necessarily fail when you want it to either. The existence of the false butterfly bend is probably the most compelling argument against the use of the alpine butterfly bend--it's hard to know for sure that you're looking at an alpine butterfly bend and not a false butterfly bend, and recognizability is an essential consideration in knot choice. This may not be too helpful, but... you could probably (eventually) get in touch with Al Warild by contacting the operators of the Cavediggers website (which currently hosts his book Vertical). Their email is on the bottom of their home page. Wow! Two quick replies. I regard Wright and Magowan to be the correct definition of Butterfly Knot because they invented the name. Alpine Caving Techniques has several slips of terminology due to the translation process. The translator was not an expert on knot names. Perhaps the French prepended the "Alpine". I do not know. What ACT calls a False Buterfly is called an Angler's Loop by Ashley, ABOK 1038. The Butterfly Knot is given by Ashley as the Lineman's Loop, ABOK 1053. Ashley credits J. Drew for the name and publication of the Lineman's Loop. Drew had publications in 1912 and 1936, neither of which I have seen, so I cannot tell if he has priority over Wright and Magowan. ek wrote: because the overall twist is now zero. This is a good way to explain it. Instead of putting the two half-twists into the bight as when starting to tie an Alpine Butterfly*, you're just sort of laying one side of the bight on top of the other in a similar configuration. Alpine Caving Techniques has a nice diagram and I actually had to look at it for a minute before I saw the difference. When I get home from work, I may break out the wacom tablet and crudely scribble the difference between the two knots at this stage, unless someone is able to scan or link to a similar diagram. 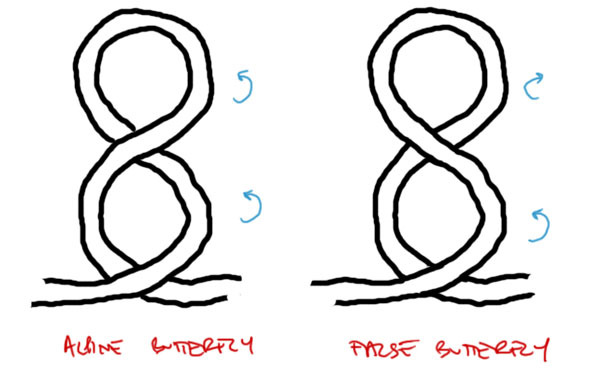 I have never tried the "false butterfly" in any situation, and cannot speak to its effectiveness for the suggested use, beyond being able to draw what not to do if you're trying to tie the Alpine version. * it's worth noting that there are two ways to tie an ABK: stealing the whimsical terminology from Life on a Line these would be the "twirly flop" (begun by forming a bight and twisting it one full turn)and the "finger poke" (begun by wrapping the rope around the hand). The diagram I refer to shows each Butterfly variant being tied using the former method. I, personally, am a twirly flopper. Well, to actually speak to its effectiveness you'd have to have an anchor failure that drops you down onto one, and note the reduction in the loop size due to the dynamic loading event. Even then, it would be hard to know for sure that it had done any good--for that, tests with a dynamometer (or repeated drop tests with very thin rope or weak but reliably rated anchors) would be required. xcathodex wrote: * it's worth noting that there are two ways to tie an ABK: stealing the whimsical terminology from Life on a Line these would be the "twirly flop" (begun by forming a bight and twisting it one full turn)and the "finger poke" (begun by wrapping the rope around the hand). The diagram I refer to shows each Butterfly variant being tied using the former method. I, personally, am a twirly flopper. I'm another twirly flopper , I much prefer this way of tying the Alpine butterfly because I can never remember all the twist tucks and loops of the wrap it around your hand method. I never really trusted that I was tying an alpine butterfly correctly until I knew how to tie a false butterfly (after reading Alpine Caving Techniques) a lot of the time I still use a figure nine in place of the alpine butterfly anyway but the alpine butterfly does look nice. Once you've seen a false butterfly it is reasonably simple (although not dead easy) to spot the difference, the false butterfly looks a fair bit different when it's loaded abnormally, it doesn't look as stable as the Alpine Butterfly. I am a finger poker (now now folks, don't start assuming additional meanings...). However, I also know and practice the twirly flop (again, let's keep this discussion to knots and rigging). As Tim White pointed out to us in Level 2 at the NCRC national weeklong last summer, the twirly flop (not Tim's nomenclature, but Dave Merchant's as xcathodex cites) is easier if you have to pull up a substantial weight of rope to tie off a damaged section. By the way, I totally screwed the pooch on drawing that diagram last night. Whoops! The double-twist method seems easier to use for tying knots with various lengths of loops, from traverse-line-short to long-Y-hang-long, but maybe that's partly because I didn't bother persevering with the hand-wrap method once my fingers learned the double twist method. OK, here is my hilarious scribble diagram of the difference. Using the "twirly flop" method, to tie an alpine butterfly you take a bight of rope, twist it 180 degrees, then twist it 180 degrees again in the same direction. This is where you are after "step 2" of the previously linked tutorial. To tie the false butterfly, you twist the bight 180 degrees, then twist it 180 degrees again in the opposite direction. The result in the case of the latter is zero twist in the rope; one side of the bight lays on top of the other, and it's a completely different knot. Here are what the two knots look like at the same stage. This is basically taken directly from the description in Alpine Caving Techniques. The blue arrows are an attempt to show the direction of twist imparted with the right hand. The remaining steps for tying each knot beyond this stage are identical. Last edited by Jeff Bartlett on Jan 22, 2009 9:28 pm, edited 1 time in total. potholer wrote: The double-twist method seems easier to use for tying knots with various lengths of loops, from traverse-line-short to long-Y-hang-long, but maybe that's partly because I didn't bother persevering with the hand-wrap method once my fingers learned the double twist method. PS - I started to type this as well, and then realized that I'm not practiced with the finger poke (hand wrap) method either, and it may well be just as easy. I found it reassuring that using twirly flops I found it actually harder to tie a false butterfly rather than an Alpine Butterfly the false butterfly tries to fall apart so you actually have to hold it together to tie it, which makes me certain I've tied the right one even before I inspect it. If you wanted a false butterfly you could do the half hitch over the loop of a slip knot suggested earlier in this thread. fuzzy-hair-man wrote: I found it reassuring that using twirly flops I found it actually harder to tie a false butterfly rather than an Alpine Butterfly the false butterfly tries to fall apart so you actually have to hold it together to tie it, which makes me certain I've tied the right one even before I inspect it. fuzzy-hair-man wrote: If you wanted a false butterfly you could do the half hitch over the loop of a slip knot suggested earlier in this thread. If you did that, you would have to pay very close attention to the orientation of...everything, to make sure to get it right. I wouldn't particularly recommend this method for actually tying it. Which is a good thing, because I was taught to twist the bight clockwise instead of counter-clockwise (well, rotating hand away from my body instead of toward my body).